Since many of you probably don’t know what it says, it roughly translates into a warning about the spammers. Spammers are sending emails claiming a package could not be delivered and you’re asked to click on the provided link. When you do click that link, malware will be downloaded on your system. So, a pretty serious situation and they advice their customers to delete it immediately. And don’t click the link in the email! Now, the big question: Why this link? I did some research by clicking the link and ending up at http://subscriber.e-mark.nl/link[snip].html which redirected me to the PostNL website. (Just snipped the link in text, but it still links to the link I received.) So, what is Emark? Well, Emark is a digital marketing solution, useful for companies that like to outsource such tasks. You can use their services to link to your CRM system and to send mass emails to your customers for all kinds of purposes. Like this warning. Problem is that those emails are sent through the Emark servers so aware customers will notice that PostNL did not mail it from their own systems. Which is one major warning sign for phishing emails. But other marks in the email do suggest it is a real message, not faked by a spammer. The link in the mail is the same domain as the sender, while spammers generally use different domains. And it was sent to the proper alias I use. So, what is the long page name in the link? Well, that is easy. PostNL uses a CRM solution and that link will most likely contain a unique identifier for every customer in their system. 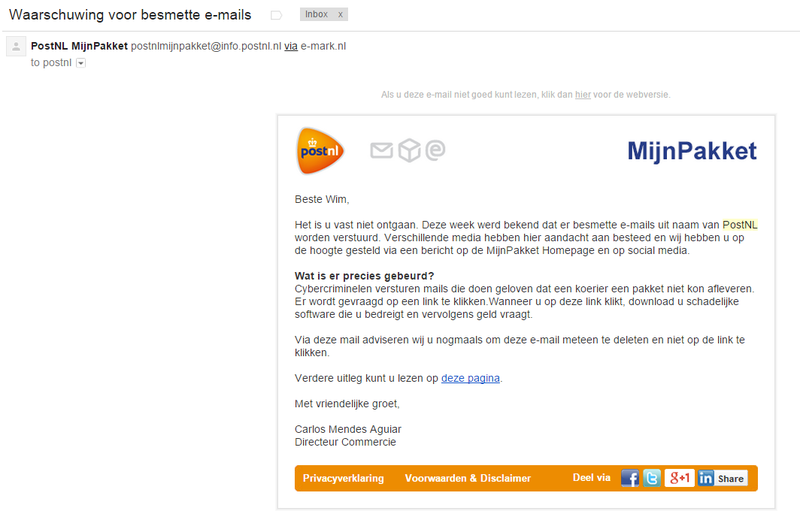 Because I clicked that link, PostNL will now know that I’ve read this email including when I visited their warning page. (Me posting that link here will probably mess up their CRM system if every visitor here will click it! 🙂 Yeah, I’m Evil!) So now they know which customers are reading their emails and who will click the links provided. Normally, those would be the customers who will be more at risk for these kinds of phishing emails since they clicked a link even though they were warned not to. That’s not a proper way to deal with your customers and it also teaches them very bad habits! And yeah, it’s time to complain about all my spam again. And what you’re seeing is what I see in my spambox. About 35 different messages received within less than 12 hours. Fortunately, they’re this many because they have been sent to multiple email addresses. Those addresses are all aliases for my mailbox, though. The interesting one is the one about eFax. I did use eFax once, many years ago when I was working on software for PBX systems. (Has something to do with phones.) So those messages could be true if I would receive them on the proper alias. I did not, so they’re fake. Anything sent to the wrong alias is fake, unless proven otherwise. Also, I am unfamiliar with the phone number in the header and it refers to the British version of eFax, while I happened to use the Dutch version. That’s enough to tell me that these are really, really fake. It’s even funnier when you check out the link, which goes to eliteom.com which happens to be a gun sales website. So, their website has been hacked. Still, some further investigations direct me to this IP address: 206.253.165.76. By using RobTex I end up at a login site for some shared hosting website running on ZPanel. Still doesn’t tell me much. It would seem the spammer has set up his own host somewhere but the link I found goes directly to a specific page, without a domain name. So, someone is using ZPanel and had their system hacked too. RobTex tells me the ZPanel host is registered by someone in Australia and hosted on servers in the USA. I might be wrong, though, but it seems that there are many layers to peel here. Moving on, I see spam for fake medicines, a warning about a dangerous parasite that’s probably fake too, a strange invoice that’s clearly fake, some shaving solution, a few naughty messages that just contain links and are hoping I’m curious enough to click and a few more weird messages. One type of spam is for Ruby Palace, a casino website that seems to hop around on the Internet. According to internet rumours, the registrar for Ruby Palace is located in India where they have no anti-spam laws so they can keep supporting this spammer. Again, RobTex is quite helpful here, telling me that the registrar operates in several countries but not India. So that rumour might not be true. It seems to be Australian, though. One thing to remember, though. Casino spam is offering you great profits, but they make even bigger profits from you spending your money there. One strange email I received is from a former colleague which was sent to my LinkedIn address. That is, my new LinkedIn address because LinkedIn had already leaked my old one. A direct message to that account is very suspicious in my opinion so I’ve marked it as spam. I’ve anonymized the header to protect my and her privacy a bit. I wonder if Liz really sent this to me, although it does make some sense considering her current employer. Well, it’s about time that I start to nag about spam again. This time someone really would like people to go trade on the financial market. Preferably in mining company called “Inspiration Mining Corp” or simply IRMGF. And yes, this is very important since the spammer wants to make a huge profit from selling his shares to you so the price needs to go up fast. 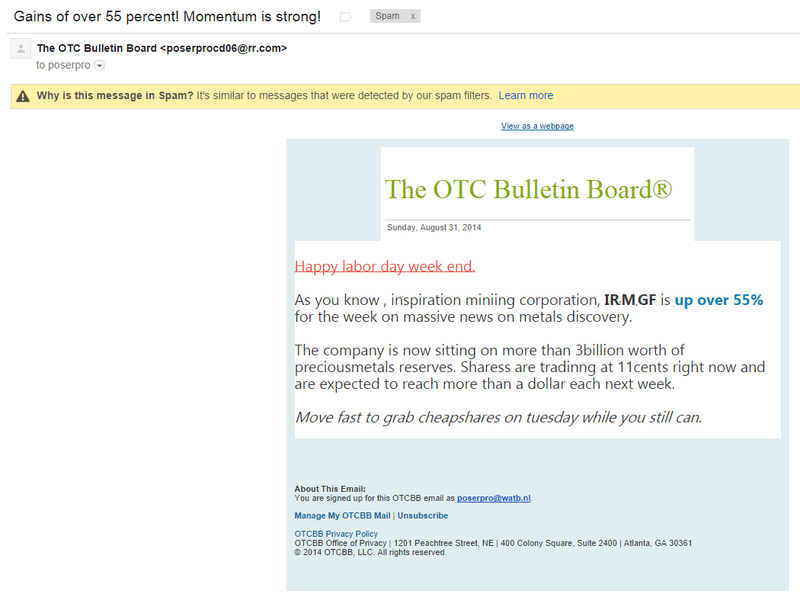 IRMGF is a so-called penny stock. This means the price of it is so low, it only costs a penny to own a piece of the company. Basically, it’s almost worthless but for some it’s still interesting to trade in. Why? Because if the price goes up just a single penny, those investors will have doubled their investment! So if you buy 100,000 in stock for a penny each and manage to increase the price by just 2 cents, then your $10,000 investment will now be worth $30,000. Which is not bad for a reasonable small investment. Problem is, with stock you never know if the price will go up or down. So it is interesting to try to manipulate the value of penny stock in all kinds of ways. The simplest way is by making people believe how ‘cheap’ the stock actually is, hoping people will start buying. And sure, some of those buyers will pay about the same as the spammers do, about a penny per stock. But this will also start to increase the value of the same stock, since people want to buy it. But when the stock price has doubled or tripled, the spammer will immediately sell his stock to those who still continue to buy it. The spammer will earn a nice profit and has almost no risk of getting caught. (Unless it can be proven that he was responsible for the spam.) Since lots of people will buy and sell penny stock it’s just not easy to find the person who has spammed among all those suspects. So, lets take a quick look at the IRMGF:US stock here at Bloomberg. The price has moved between 4 cents and 16 cents during the whole year. If you bought stock in December 2013 and sold it again in May/June 2014 then you would probably quadruple your investment. Not bad for just a few months waiting. But now the price has dropped to below 7 cents per stock so it is interesting to start buying again, hoping the price will go up again. Then again, this is how the stock market works. You buy stock as an investment to keep your money safe. If things go well, you should make a small profit on your investment. If not, you should sell before the stock becomes worthless. Most people with money don’t really buy stock to make profits but to make sure their money is reasonable safe. But they will have to check the market continuously to make sure their stocks are stable enough. This is a bit time-consuming and many investors will use computers to watch the stock market for them. And probably hire a financial advisor who does nothing else but trade in stock to keep the invested value stable. Penny stock is reasonable unreliable because the low price suggests that the company behind the stock isn’t doing so well. If they have to file for a chapter 11 because the company is dead broke, your stock will become worthless. You’d rather invest in something more stable and reliable and start selling it when you expect its value to drop. Now, why do I start about this spam? Well, simple. For the last 5 days I’ve received hundreds of spam messages on various of my email aliases. This is practical because it tells me which companies have shared my mail address with those spammers. Adobe and LinkedIn are, of course, the usual suspects because their databases have been hacked. As a result, I still receive lots of spam on those aliases. Another company that apparently got hacked is SmithMicro where I purchased my Poser software for the CGI models. I also noticed strange addresses like waterside__9.jpga@example.com and tayen-usenet-a@example.com which I never even created. I don’t know why those spammers are using those aliases but maybe the person who owned the specific domain before I did used those accounts. And there have been more variations of this spam. A few things are easily noticeable. First of all the spelling in both messages is just plain bad. They included other characters in the stock name, spaces are missing in some places, “mining” is spelled wrong and a few more things. This is done on purpose to get around spam filters, although it just doesn’t seem to work with the Google spam filters. The sender happens to be fake, though. All spammers will use fake email accounts, often collected from their own spam lists to make it seem legitimate. So responding to the sender or anyone else in the email is useless. You’d just be harassing some other innocent person. Yet many people do think it helps so they respond to complain about the spam. Or report the account to their ISP, accusing them of spam. Most providers are smart enough to recognise this, though. They won’t take actions against the fake sender because they know he’s just a victim too. The email also has several links to make it look more legitimate. But in this case, even those links are fake. They are a combination of the email address (the part before the @ sign) and some gibberish with .com or .org after it to generate a domain. It also includes a path on the fake domain that looks legit but since the domain is fake, the whole link is fake. This spammer just doesn’t want anything that would link back to him. So, would the IP address in the email header be any helpful? Unfortunately, not much. The computer behind that IP address is most likely part of a bigger botnet. A machine infected by malware that the spammer can use to send his spam. You could report the IP address to the related provider and hope the provider will take the specific user off the Internet until he has cleaned his computer but in general, that’s not going to happen. Thus, these spam messages are hard to stop. The spammer is difficult to trace since a lot of people will be trading in this penny stock. Some investors might even consider investing in it since they expect the price to go up even further because of this spam. As I said, the price has been over 16 cents at one point and now the price is 11 cents. If it continues to go up, they could still make profit from it. Penny Stock Spam is a very difficult one to fight against because the spammer can hide himself very well. He doesn’t have to add a link to his webshop or to some infected website that could be closed within a day after it has been reported. There’s almost no trace to the spammer either. The only thing that helps against this kind of spam is to not buy the stock, not even if you’re an experienced investor and still expect some profit. You will most likely lose money on those transactions because you’re just paying the spammer himself. But if you’re lucky, a bigger moron will still buy the stock and give you some profit. And that’s the worst part of this spam. It’s not just the spammer who will profit but some investors might also have a smaller profit from it. As I said, if it goes up just a cent, they would have made a huge profit already. I recently received an email from a company that’s doing questionnaires. And well, I subscribed to this and did some of their questionnaires before, so I wanted to do this new one too. Unfortunately, the page loaded quite slow, only to return a very nasty error message. A message that told me that this organisation is using amateurs for developers and administrators. So, what’s wrong with this? Users should never see these messages! When you develop in ASP.NET you can just tell the system to just keep these error messages only when the user is connected locally. A remote user should see a much simpler message. This is something the administrator of the website should have known, and checked. He did not. By failing at this simple configuration setting the organisation is leaking some sensitive information about their website. Information that’s enough for me to convince they’re amateurs. This is a standard follow-up message. The fact that users of the site would see this stack trace too is just bad. A timeout error. A reference to the connection pool and the max pool size. This already indicates that there are more connections are opened than closed and the system can’t handle that correctly. There are frameworks for .NET that are better suited for this to prevent these kinds of errors. That’s because these errors happened to be very common with ASP.NET applications. And with generic database applications written in .NET. Basically, the top of the error message is just repeating itself. Blame Microsoft for that since this is a generic message from ASP.NET itself. Developers can change the way it looks but that’s not very common. Actually, developers should prevent users from seeing these kinds of messages to begin with. Preferably, the error should be caught by an exception handler which would write it to a log file or database and send an alert out to the administrator. This is interesting… The use of SqlCommand is a bit old-fashioned. Modern developers would have switched to e.g. the Entity Framework or other, more modern solution for database access. But the developers of this site are just connecting to the database in code, probably to execute a query and collect the data and then should close the connection again. The developers are clearly using ADO.NET for this site. And I can’t help but wonder why. They could have used more modern techniques instead. But probably they just need to keep up an existing site and aren’t they allowed to use more modern solutions. But it seems to me that closing the database is not going to happen here. There are too many connections already open thus this red line of code fails. The code has an existing connection called cnSQLConfig which is already open. It then tries to open and execute an SQL command that fails. Unfortunately, opening that command happens outside a try-except block and if this fails, it is very likely that the connection won’t be closed either. If this happens once or twice, then it still would not be a big problem. The connection pool is big enough. But here it just happened too often. Another problem is that the ADO.NET technique used here is also vulnerable for SQL Injection. This would also be a good reason to use a different framework for database access. It could still be that they’re using secure code to protect against this but what I see here doesn’t give me much confidence. Second of all, this piece of code has over 1580 lines of code. I don’t know what the rest of the code is doing but it’s probably a lot of code. Again, this is an old-fashioned way of software development. Nowadays, you see more usage of frameworks that allow developers to write a lot less code. This makes code more readable. Even in a main index of a web site, the amount of code should be reasonable low. You can use views to display the pages, models to handle the data and controllers to connect both. Yes, that’s Model-View-Controller, or MVC. A technique that’s practical in reducing the amount of code, if used well enough. And one more thing is strange. While I replaced the name of the site with ‘example.com’, I kept the word ‘beta’ in front of it. I, a user, am using a beta-version of their website! That’s bad. Users should not be used as testers because it will scare them off when things go wrong. Like in this case, where the error might even last the whole weekend because developers and administrators are at home, enjoying their weekend. Never let users use your beta versions! That’s what testers are for. You can ask users to become testers, but then users know they can expect errors like these. And that’s the stack trace. We see the site loading its controls and resources and the ‘Page_Load’ method is called at line 251. At line 1706 the system is apparently loading country-information which would be needed to set the proper language. Then it returns to line 1580 where it probably opens some table based on information from the language file. 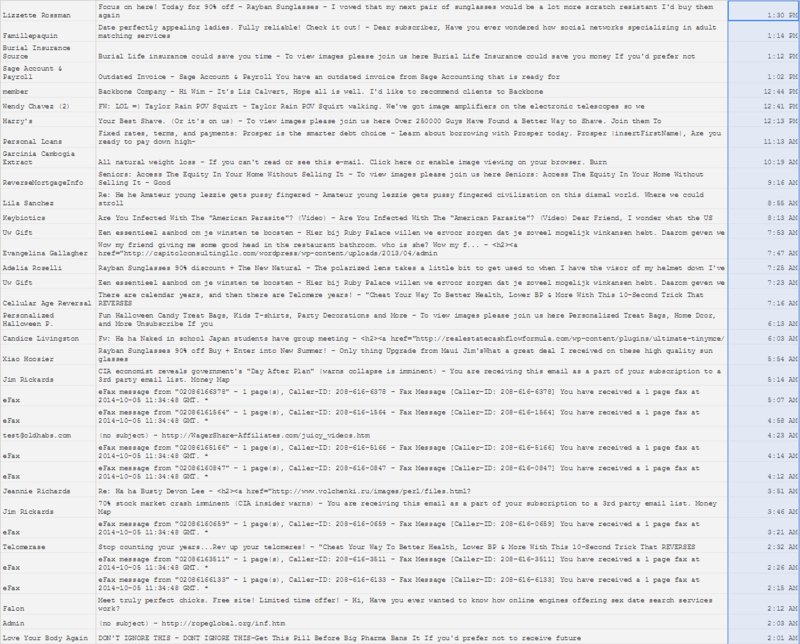 Again, this is a lot of code for basically loading the main page. I even wonder why it needs to load data from the database based on the country information. Then again, I was about to fill in a questionnaire so it probably wanted to load the questionnaire in the proper language. If the questionnaire is multi-lingual then that would make sense. The administrator did not prevent error messages to show up for users. The use of ADO.NET adds vulnerabilities related to the connection pool and SQL injection. The use of VB.NET is generally associated to less experienced developers. The amount of code is quite long but common for sites that are developed years ago. Not using a more modern framework makes the site more vulnerable. Country information seems to be stored in XML while the questionnaire is most likely stored inside the database. The .NET version has been out-of-date for a few years now. My advice would be to just rewrite the whole site from scratch. Use the Entity Framework for the database and MVC 4 for the site itself. Rewrite it in C# and hire more professional developers to do the work. On October 3, 2013 Adobe’s Database was hacked and about 150,000,000 Adobe users have their data exposed to a bunch of hackers. Anyone who even registered a single Adobe product , like I did,now has to deal with some extra spam in their mailbox. Unfortunately for the spammers, I used an alias that was used for just Adobe and after the hack, I provided them a new alias. As a result, any email on this old alias is now considered spam. The hacked database was published and several companies have been datamining it to find their own users inside the database and to warn those users. In my case, only Adobe gave me a warning since only Adobe knew my alias. However, some companies are misusing the same database to pretend people have subscribed to their services and are sending spam to those people. And one of those companies calls itself TipsViaEmail. First of all, if I did subscribe to their services, I would have used a different alias for them. Instead, they’re spamming me on my Adobe alias. Why? Not really sure but I guess they’re trying to make some profit this way. Today I received a spam message from TipsViaEmail about some new way to chat with random people through Whatsapp. A bit like “Chat roulette” but on top of the Whatsapp engine. I’m not going to post the URL to this app because my virus scanner warned me about possible malware on their site. It seems extremely unreliable to me and is likely part of a trick to collect phone numbers, email addresses and perhaps even to infect mobile phones with malware. Don’t even try their stuff! I think TipsViaEmail makes profit because they’re paid by these malicious companies to spam a lot of people. TipsViaEmail has a source of legitimate email accounts and claims these people subscribed to their service. So, people have to prove they never subscribed, which is difficult to do. How do you prove it? Well, I can because I have a habit of assigning aliases to every company I contact. And I can show how they got my address since they used my Adobe alias that was stolen by hackers. They keep sending me emails once in a while but in low quantities so they won’t get a bad reputation with their providers. 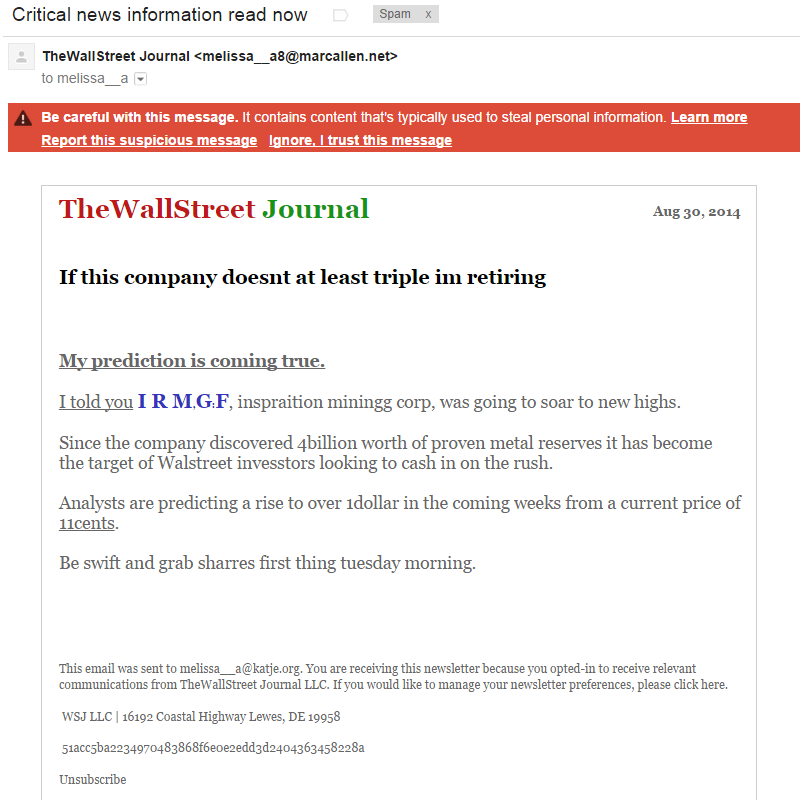 They send these spam messages through vistomail.com, which happens to offer ways to send email anonymously. Thus Vistomail is enabling spammers to send spam. TipsViaEmail also allows a way to unsubscribe from their services by sending an email to an address at simpel-nieuwsbrief.com or by following a link at simpeltracking2.nl. In both cases, doing so would confirm your email address to TipsForEmail, making it profitable to sell to other spammers. They might stop spamming you, but those other spammers will start spamming you afterwards. At WhatCounts they calculated how much they could make by selling an email address and they earned about $17.34 per address! So we’re not talking about pennies when we’re talking about the value of email addresses. And TipsViaEmail got their list for free because those hackers, who published the whole database! So first, if you ever subscribed to an Adobe product then change your password immediately! Not just the password for your Adobe account but for all other accounts you have that used the same password! The passwords in the Adobe database were encrypted, but this encryption is being broken now so they will soon be exposed. Next, find a way to use your own aliases with your mail provider. I did this by just getting my domain name, which costs me EUR 9.95 per year. I also use Google Apps so Google handles my email, even though it’s on my domain. And no, I don’t fear the NSA spying in my mailboxes. I just won’t send top-secret stuff by email anyways. It costs me another EUR 40,00 per year. But Microsoft Outlook and Yahoo Mail also offer similar services to connect your own domain to their email services. I just prefer Google since I think they have the best spam filter. Finally, if you notice spam arriving at any alias, contact the company responsible for leaking your alias. (Adobe in my case.) They might not know their system has been hacked. And feel free to report the email to the proper channels. SpamCop is a good option internationally. (Do be aware that their URL ends at .net, since there are many copycats misusing their name!) For Dutch people you can report them too at SpamKlacht and people in Belgium can report spam to E-Cops.